In a far-off corner of the land of Ilnacia, siblings Velk and Thiana run an underground slave market. One rainy night, a customer arrives with an unusual request: for the two to take a girl into their care for six months. The Specialize system, where SP won from battles can be used to level up Specialties and learn moves or passive skills. An item synthesis system, where you can use raw materials to create anything you have the recipe for. 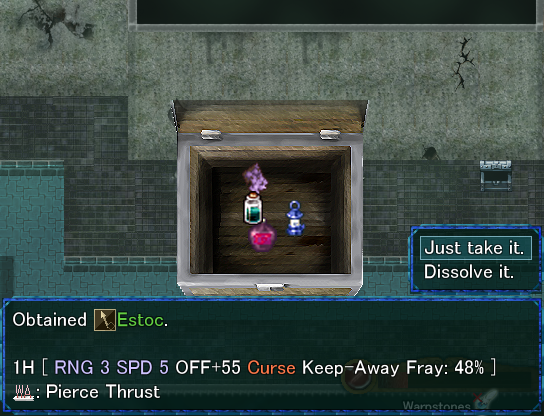 Fully-randomized equipment dropped by enemies, as well as fixed equipment from shops and the like. A fortification system of embedding Orbs into equipment to grant it additional properties and stat boosts. Click here for content warnings. Slave trading (albeit showing very little abuse of slaves). 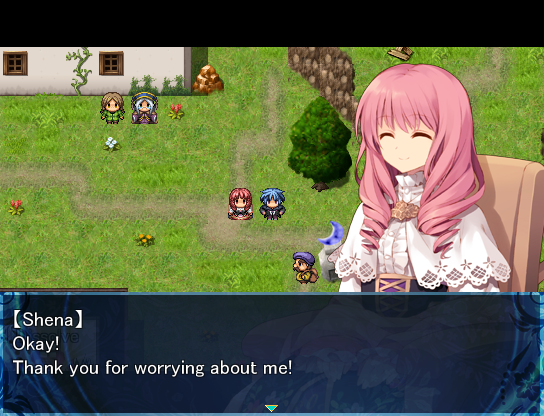 Installation of the RPG Maker VX Ace Runtime Package (not VX) is required to play. If you extracted the ZIP but save data is still being erased, try running the game as an administrator. Without admin privileges, the game may not have permission to create save files. "RPG Maker VX Ace RTP is not installed" means you need the RPG Maker VX Ace RTP. This is distinct from the VX RTP which other games may require. The download link is up above. If dialogue seems to be using the wrong font (which may cause cutoff text), download and install MS PGothic. Tables of all skills learned via leveling up Specialties, to assist in deciding which ones to focus on. 2 Momentum Blow Tech Attack an enemy. Damage is higher the more Stamina the attacker has left. 3 Eagle Eye Tech Boost Accuracy, Offense, and ST recovery for 5 turns. 5 Chain Tech Get two actions on the next turn. 10 Flame Dance Tech Deal fire damage to an enemy. 13 Arm Break Tech Attack the arm to temporarily lower Offense. 16 Offense Up I Passive Boosts Offense by 10%. 18 Big Swing Passive Adds +5% to critical rate. 20 Defend Buff Passive Improves effect of Defend command. 22 Defense Up I Passive Boosts Defense by 5%. 23 Heaven's Road Tech Instantly halve enemy HP, but it gradually recovers over 10 turns. 28 Enemy Block Tech Block all damage from a single attack. 35 Offense Up II Passive Boosts Offense by 20%. 44 Last Nerve Tech Increase Offense by 50% for 10 turns, but lose all commands but Attack and Item. 48 Defense Up II Passive Boosts Defense by 10%. 2 Fray Spell Deal minor fire damage to an enemy. 3 Melica Spell Recover some HP to a member. 4 Meditate Tech Recover some MP, and continue to slowly recover MP. Defense is slightly lowered throughout. 5 Ricov Spell Unpoison a member. 6 Snoa Spell Deal three bursts of ice damage to an enemy. 8 MP Up I Passive Boosts max MP by 10%. 9 Sparca Spell Deal minor lightning damage to two random enemies. 10 MP Regen I Spell Recovers 1 MP each turn. 11 Aeril Spell Deal minor wind damage to all enemies. 13 Spirio Spell Boost all members' Agility for 5 turns. 15 Frayd Spell Deal fire damage to an enemy. 17 Snoal Spell Deal ice damage to all enemies. 19 Offinis Spell Boost all members' Offense for 5 turns. 21 Sparced Spell Deal lightning damage to three random enemies. 23 Aerspra Spell Deal wind damage to an enemy. 25 Ricoval Spell Unpoison all members. 27 Delife Spell Absorb HP from an enemy. 29 Melicrain Spell Recover HP to all members. 30 MP Regen II Passive Recovers 2 MP each turn. 31 Aerspard Spell Deal major wind damage to an enemy. 33 Frayzed Spell Deal major fire damage to an enemy. 35 Rosary Spell Bring back a fallen member. 37 Snoastra Spell Deal major ice damage to an enemy. 39 Melicado Spell Recover HP to a member. 41 Sparcion Spell Deal lightning damage to all enemies. 45 MP Up II Passive Boosts max MP by 20%. 48 Chaos Blade Spell Deal major physical damage to an enemy, and induce Bleed. 50 Magic Mastery Passive Increases power of all fire, wind, and ice spells, as well as Chaos Blade. 4 Search Tech See enemy weakpoints. 5 Accuracy Up I Passive Boosts Accuracy by 5%. 10 Evasion Up I Passive Boosts Evasion by 5%. 16 ST Regen I Passive Recovers 3 Stamina each turn. 28 Accuracy Up II Passive Boosts Accuracy by 10%. 30 Evasion Up II Passive Boosts Evasion by 10%. 33 Counter Passive Adds +5% to Counter rate. 38 ST Regen II Passive Recovers 6 Stamina each turn. 2 Divine Wrath Prayer Deal lightning damage to an enemy, and sometimes cause Stun. 3 Rising Light Prayer Slightly recover a member's HP, leaving a healing aura for a few turns. 4 Favor I Passive Improves recovery of oneself. 6 Rain of Fire Prayer Deal fire damage to all enemies. 8 God of Fortune I Passive Sets minimum Luck at 20. 10 Stat-Down Evasion I Passive Reduces chance of getting stat-down ailments. 12 Healing Wind Prayer Recover HP to all members with a soothing breeze. 15 HP Regen I Passive Recovers 10 HP each turn. 17 Fog of Decay Prayer Deal poison damage to all enemies. 20 Droplet of Rebirth Prayer Cure a member of Curse, Fatal Wound, Sleep, and Stun. 23 Hypnotize Prayer Put all enemies to sleep. 25 HP Regen II Passive Recovers 20 HP each turn. 28 Light of Tribulation Prayer For 15 turns, all members' current HP is reduced, but max HP is boosted by 30%. 31 Favor II Passive Improves recovery of oneself. 34 Stat-Down Evasion II Passive Reduces chance of getting stat-down ailments. 37 Wind God Guard Passive Increases wind resistance. 40 Spirits' Blessing Prayer Recover 20 MP to all alies. 43 Blessing Passive Boosts EXP gain by 10%. 46 Conviction Blade Prayer Deal physical damage to all enemies. 48 God of Fortune II Passive Sets minimum Luck at 50. 49 Flames of Retribution Prayer Deal fire damage to an enemy. Damage increases based on number of fainted members. 50 Prayer Master Passive Reduces consumption of alms by Prayers, and powers up all recovery and poison spells. 2 Icicle Space Magic Deal minor ice damage to two random enemies. 3 Relaxation Space Magic Recover minor Stamina to all members. 4 Holy Might Space Magic Makes weapon absorb 20% of damage for 2 turns. 5 Poison Injury Space Magic Deal poison damage to an enemy, which may inflict poison. 6 Armor Breath Space Magic Reduce physical damage to all members for 3 turns. 8 Illusion Space Magic Make a member less likely to be targeted for 5 turns. 10 Element Resist I Passive Slightly increases magic and element resistance. 12 Spell Speed Up I Passive Speeds up casting of Magic and Space Magic. 14 Magic Barrier Space Magic Boost all members' element resistance for 3 turns. 16 Discord Space Magic Increases all enemies' MP costs for 5 turns. 18 Healing Mist Space Magic Slowly recover members' HP for 5 turns. 23 Cyclone Space Magic Deal wind damage to two random enemies. 28 Diamond Dust Space Magic Deal ice damage to all enemies. 32 Spell Wall Space Magic Halve a member's defense in exchange for a spell-reflecting wall. Runs out after 5 turns. 36 Element Resist II Passive Slightly increases magic and element resistance. 40 Meteor Storm Space Magic Deal fire damage to all enemies. 43 Spell Speed Up II Passive Speeds up casting of Magic and Space Magic. 47 Bold Magic Space Magic Raise a member's MP cost and boost their Magic for 5 turns. 3 Torchlight Survival Make dark dungeons brighter than usual. 4 Cure Potion Survival Use 1 Pure Fruit to cure poison and heal a member. 7 Toughness I Passive Increases resistance to Poison, Sleep, and Bleed. 8 HP Up I Passive Boosts max HP by 10%. 10 Shower Potion Survival Use 1 Medicine and 1 Vitality Shroom to recover some HP to all members. 13 Pharmacy I Passive Boosts effect of items. 15 Skill Up I Passive Increases Skill by 10%. 16 Critical Bomb Survival Use 2 Bombs to deal fire damage to an enemy. 19 Revival Survival Bring back a fainted ally, but with very low HP. 20 Power Bomb Survival Use 1 Bomb and 1 Vitality Shroom to deal fire damage to all enemies. 22 Coin Shoot Survival Throw money to deal physical damage to all enemies. Damage and amount thrown increases with total money. 25 Stun Raid Survival Attack an enemy normally, then Stun it 3 turns later. 28 Pharmacy II Passive Boosts effect of items. 30 IQ Potion Survival Use 1 Wisdom Wing to boost a member's Magic and lower their MP cost. 35 HP Up II Passive Boosts max HP by 20%. 40 Stoic Survival Boost personal EXP gain for the battle by 10%. 42 Skill Up I Passive Increases Skill by 20%. 45 Toughness II Passive Increases resistance to Poison, Sleep, and Bleed. 47 Spirit Cluster Survival Use 1 Bomb to deal lightning damage to all enemies. 49 Enchant Force Survival Use 1 Wild Flower to make weapons adjust to weakpoints. 50 Weapon Mastery Passive Allows use of all weapons. For the most part, the plot lets you know exactly where you need to go next. The Progress screen will also remind you of where to go at all times. Main Story: Where am I supposed to search in the archives? There's a switch in the bottom-right bookshelf in the room where you fought the boss. However, you'll need to use Manarel Dust to light the torch near the shelf to be able to see and interact with the switch. Two of the easiest quests to miss are Orlando's in Prismriver. After you do Nagura's quest and get the Small Beer Bottle, you aren't alerted to it at all, but you can give it to Orlando nearby to fill him with energy and get a quest from him. Once you complete that quest, you'll get the Crystal Key Seal. Restore the Crystal Key at the Ancient Forge and give it to Orlando to get a second quest. Since you're never required to go to it, you may miss the town of Orge entirely. Go south from the entrance to Persadal to reach it, then go east to Seaside Path to find Maple, who has a quest. Miscellaneous information, mostly about how to get 100% of everything. Spoilers for the entire game within! There are three ingredients around Sugar to put in the gross Cranberry Tea. You only need one, but the number you collect changes the reward you get from the messenger: a Manarel Shard for one, a Shiny Manarel for two, and an Engrave Orb for three. During the ship segment, there are two quasi-sidequests. The first: Before the Devil's Sea part, read the notice near your room, and defeat the ants at all three marked barrels. You will receive a Silver Idol once you reach Lumist. The second: Read the notice after the Devil's Sea and talk to Pearl on the bottom deck to get her cooking. Give it to the captain after Blue Orion leaves. You will receive a Shiny Manarel once you reach Lumist. The cost of healing at crescent moon monuments is based on Velk's level squared; other members' levels and number of moon monument uses have no bearing. Each Faith Talisman reduces the cost by 4%. 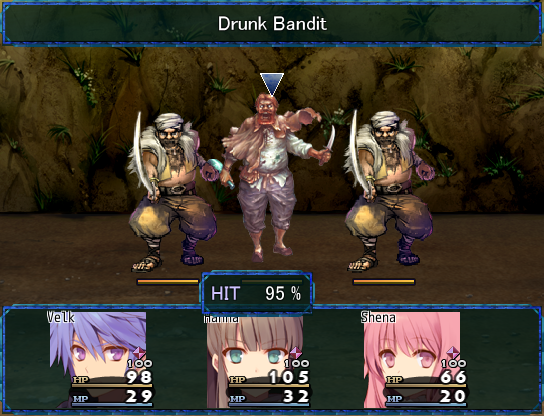 During certain parts of the game, usually when you have a small party, the cost is reduced to a fifth of the usual. The maximum amount healing can ever cost is 5,000 Galuc. The cost of inns, on the other hand, is simply double Velk's level plus 5. Materials picked up from the ground/walls/water (in "overworld" areas, not in dungeons) don't go away forever; there's a timer that puts back a scattered selection of materials every 100 seconds. It does this in six groups, so any given material is guaranteed to respawn within 10 minutes. However, the timer also advances 20 to 30 seconds (random in that range) after normal battles. Note, though, that the timer doesn't run as normal when you're in battle, so you're only saving time if you win faster than that. Rozea in the northeast corner of Lumist gives rewards for every five Thank-You Notes you get from completing quests. There are a total of 40 quests. Two quests (in Fort Pana) are missable, but as of 1.08, will be auto-set as completed after you beat the main game. Used at the Ancient Forge to restore sealed items. Allows you to influence chests to more often contain a specific type of equipment (weapon, shield, armor, helmet, accessory). Allows you to influence the elemental resistances of random equipment. A ring that adds 200 Luck. Allows entry to the bottom floor of Chardam. The most notable rewards there are recipes for the Diffusion, Almighty, and Engrave Orbs. The crown that was, uh, stolen from the entrance to Sanuzam Ruins in Distana. If you put it back on that pedestal, it opens the door. You can get the Gold Crown and recipes for Miracle Apples in the last room. Both crowns being gone will cause the Dark Dragon to appear at the entrance; beating it gets you the Kagenui, a very powerful sword. The Crystal Shrine is an optional area that's tricky to actually get to. It's split into a north and south half, and you can only reach it via Warpstones to those halves. Said Warpstones can only be gotten from the Ancient Forge; their seals drop randomly from high-level chests. Of course, you can still use the codes without having the seals. I'll provide them here if you don't want to farm for the random seal drops. Capella, below the "fountain" just outside the front door of the castle. Filip's Home, in his vegetable garden in the backyard. North of Prismriver, right outside the Mountain Cabin. Sandcloud Valley, right outside the Sacrificial Altar. Mersus, at the broken statue in the northeast. Ice Dragon's Den, just northwest of the Entrance to Meusta teleporter. Crystal Shrine. From the South entry point, go west to the next map, follow the path, and turn right at the T-shaped intersection to two Tear Stone doors across from each other. The gate leading to Persadal. Cranberry Fields, south of Cranberry. Chardam B5F, next to the orb recipes. South of Fort Pana, right by the entrance to the fort. Blue Orion Base, by the Water Ruins entrance. Carnack Path, north of Carnack. Do the quest for Baron in Norma Woods (outside Chardam), and you'll get the recipe for beating Karsikko. Defeat the Fog Titan at the end of the marsh segment (as part of the plot). Defeat the Relic Lord on the bottom floor of Ludoir Ruins (as part of the plot). Do the quest for Dhamso in Carnack, and you'll get the recipe from Ralg. Do both goblin quests at the Travelers' Outpost. You'll get the recipe for beating the Goblin Boss. Do the quest for Porte in Cranberry to get it in the reward. In a chest next to the Ancient Forge. Do the quest for Kino in Meusta. Same as the Chief Megaloma, but the recipe is on the sign behind the Goblin Boss. 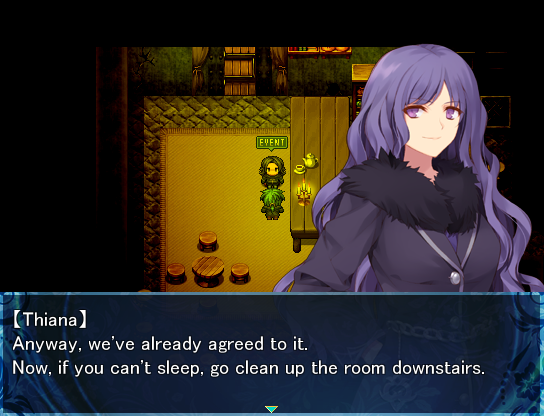 Get 35 Thank-You Notes to earn the Entry Permit B5F from Rozea, then go to the bottom floor of Chardam. The recipes are written on a pillar at the top of the area. Get 40 Thank-You Notes for the Doldoa Silver Crown, allowing you to proceed in the Sanuzam Ruins. Recipes for all types of Miracle Apples are on signs in the last room; one for HP/MP, one for the other five stats. Given to you by Hanna in Balha Cave (as part of the plot). Do the Trick House quest for Bamboo in Mersus to get the permit to enter Chardam B3F/B4F, then get it from a chest on B4F. Do the Crystal Key quest with Orlando in Prismriver. The chest is at the south side of the secret area in Prism Cave. In a chest near the start of the Undersea Tunnel. Win a fixed encounter with four Elementals on the first screen of the Sleeping Forest (west of Capella Castle in the post-game). On a slab in the second screen of the Sleeping Forest (west of Capella Castle in the post-game). All other recipes are available from recipe shops. Recipe shops everywhere have the same stock, which is added to as you progress the plot, finalizing once you arrive in Capella. Carnack Path: North from the right side of the waterfall, through the trees. North of Outpost: North and right of where you hop over the river. North of Mersus: Behind a tree in the area with the Drakes and their fangs. Trick House: Bottom floor, the only unopened chest in the room with the emptied chests. Seaside Path: Head directly east from Orge. Path to Valgard Region: The path between East of Valgard and West of Prismriver. Prism Cave: Top-right of the secret area in Orlando's Crystal Key quest. Windy Grotto: The path between Valgard Plains and Sand Path. Sacrificial Altar: Behind a stone door in the bottom-left of the second floor. Undersea Tunnel: On the first screen.